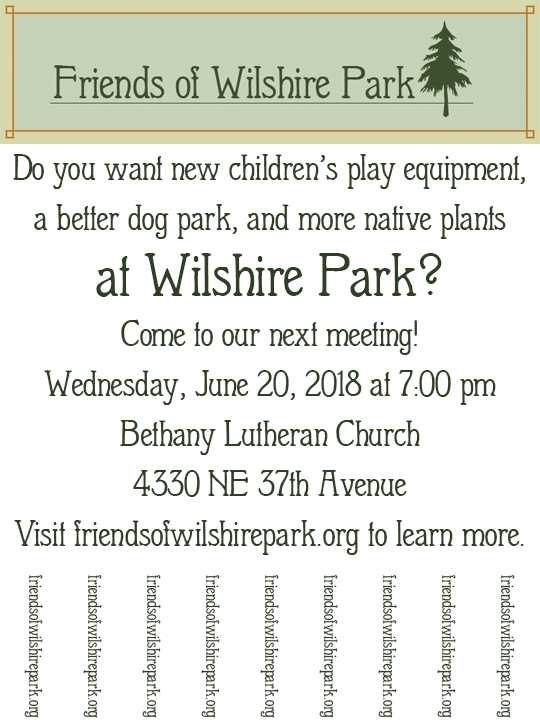 Friends of Wilshire Park will have its next meeting on June 20 at Bethany Lutheran Church at 7:00 p.m. The church is located at 4330 NE 37th Ave, Portland, OR 97211, at the northeast corner of Wilshire Park. May’s meeting was attended by three representatives from the City of Portland: Parks Commissioner Amanda Fritz, Community Relations Manager Jennifer Yokum, and Ecologically Sustainable Landscapes Manager Eric Rosewall. The Friends were grateful for their attendance and willingness to hear the group’s concerns and ideas. Commissioner Fritz had let the Friends know that there was a small amount of bond money available to make improvements to the children’s play area, and this presented a small window of opportunity for the group to do some fundraising which could enhance the budget for such a project. At our June meeting, a city representative will be on hand to tell the Friends about the bond funds and what the possibilities are for their use. Members of the community who have a strong interest in the children’s play area would benefit from participating in this crucial discussion. Also on the agenda is the NatureSpace, which has been issued a generous grant from the Community Watershed Stewardship Program and will happen this summer. Now that a baseline budget for the project has been established, the Friends will begin crowdfunding to make the project even better. When a timeline for the project has been set, the Friends will begin organizing the volunteers who will clear the site, install the path and fence, and transplant native shrubs and plants. The last agenda item (for now) is making a list of very small, simple projects that could be done in a single day, such as cleaning and repainting the signposts around the off-leash dog area. The paint in the engraved signposts has long faded away, and one can of paint and few people handy with sandpaper and small paint brushes could make them legible again. 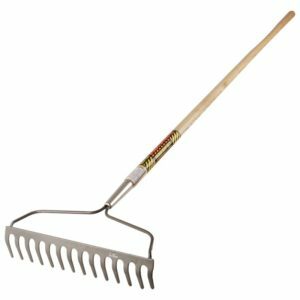 If you have other ideas for very small, simple, inexpensive projects that could be done at the grassroots level, leave a comment! 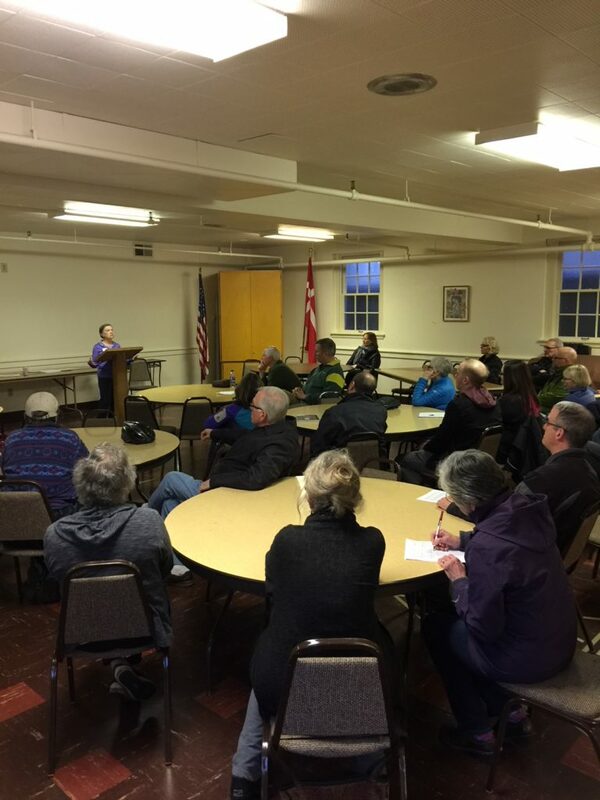 Friends of Wilshire Park met on Wednesday, April 23, with 17 Friends and three representatives of the City of Portland in attendance. This was a big meeting for our group, as we were able to speak with officials from Portland Parks and Recreation: Commissioner Amanda Fritz, Community Relations Manager Jennifer Yokum, and Ecologically Sustainable Landscapes Manager Eric Rosewall. The Friends were very grateful for the time these representatives were willing to give after a long day’s work. Jennifer Yokum expressed thanks to the Friends for their enthusiasm and willingness to volunteer, explaining that Portland’s parks are greatly enhanced by work done during more than 500,000 volunteer hours every year. Commissioner Fritz was able to provide an overview of the situation with Portland’s parks at present. There are over 200 parks in the city, with about $400 million dollars in maintenance needs and another $400 million in improvement needs. During the recession, cuts to the parks budget were deep, and although we are now in recovery from that period, there is a lot to do. The city has chosen at this time to focus on the problem of homelessness as its key issue, as well as cost recovery and financial sustainability. All of this means that the parks budget is limited, and there isn’t any money or staff time to give to Wilshire Park. The city is midway through an equity plan, in which all parks funds are devoted to geographic and racial equity. There are large areas of Portland, particularly in the east, where there were no parks at all, so the city decided to devote its entire budget for improvements to these areas. An impressive facility went in recently at Luuwit View Park, with a sculpture garden, play area, off-leash dog area, community garden, teen area, amphitheater, picnic grounds, and plenty of green space. These projects were built to serve the thousands of families that didn’t have any park at all, but the bottom line is that Wilshire Park will receive no funds or staff time for planning projects from the city, and our group is on its own if we want to see anything happen in our neighborhood. There is a possibility that some of the children’s play area equipment may be improved soon, and this may open a small window of opportunity to fundraise to allow for even more improvements to be tacked on. This is challenging information to hear, but members in attendance at the meeting made the case for why their park deserves a little attention. As a large, flat space in the heart of Northeast Portland, it serves a fairly diverse population as it connects more and less affluent neighborhoods, and its varied facilities make it a big draw. The play area is the only one for miles with play equipment suitable for toddlers, although this equipment is over 25 years old and beginning to decay. After the meeting, the city representatives were kind enough to walk over from Bethany Lutheran Church to the play area to see the state of the children’s equipment and provide further advice on the best way to work with the city, raise funds, and implement improvement projects. For now, the most likely scenario is that any large project will need to be entirely funded by our group. 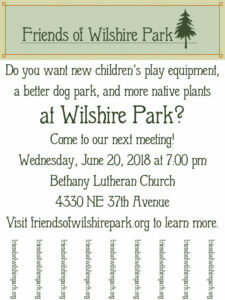 Friends of Wilshire Park will meet again soon. Please subscribe to our newsletter for updates and information about meetings and projects. We will soon be putting out information about our NatureSpace project, which will bring a sustainable native landscape to a disused area of Wilshire Park. We also have ideas about simple projects to improve the jogging trail and dog park, so volunteers should get their work gloves ready. Hi, Friends! It’s time for our next meeting. We do apologize for the late date of scheduling, but lining up busy schedules was difficult. However, we managed it and our next meeting will be held Wednesday, May 23 at 7:00 pm at Bethany Lutheran Church at the corner of NE 37th and Skidmore. City Commissioner Amanda Fritz and Portland Parks and Recreation Community Relations Manager Jennifer Yocom will attend, making this a particularly important meeting for our organization. We are looking forward to a good discussion and better understanding of what options are available to us as we partner with Portland Parks and Recreation on improvements to Wilshire Park. We appreciate their attendance, as it shows faith in us as a fledgling organization, so we hope that as many Friends of Wilshire Park can turn out as possible. Please help us spread the word! Let your neighbors know and invite them to come. We need all kinds of helping hands to participate as we continue to maintain and improve Wilshire Park as a very special place in the heart of our community. At the second meeting of Friends of Wilshire Park, Julie Bernstein acted as host. 17 people were in attendance. The meeting began with a report from Georgina Head, who has been speaking with people at Portland Parks and Recreation about the best way to form a good relationship with them. She explained how projects are funded at the city level, and also that currently there is very little in the budget for Wilshire Park. Georgina stressed the importance of our group forming a board and making plans for practical, attainable goals. Once we have established ourselves as an organization with a clear structure and commitment to concrete goals, the Parks Department would be able to assign a liaison to work with us. The Parks Department may send representatives to our next meeting, which would be a very important first step in establishing an official relationship. Attendees introduced themselves and after a bit of coaxing and volunteering, several people were recruited to form the Board of Friends of Wilshire Park. Gary Hancock will serve as President, with Dawn Sorem as Vice President. Tiffney Townsend will serve as Communications Officer. Nancy Mogielnicki, Peter Mogielnicki, Rand Schenck and Gesher Kitzler will serve as Board Members At Large, focusing on specific park projects and the groups around them. The members of the board at present are mainly from the Beaumont-Wilshire neighborhood and the Alameda neighborhood, and in future will actively seek out more members from surrounding neighborhoods such as Cully, Alberta, or Rose City Park. Friends of Wilshire Park will also need a treasurer and are actively seeking volunteers for this position. A date needs to be chosen for our next meeting. The 9th or 23rd of May were suggested, and the Board will put out a message soon when we have a date and location. This summer the group may host a community picnic in the park instead of a regular meeting. Nancy Mogielnicki gave an update on the Nature Space, which will be the first project run by Friends members. This is a good first project, as it is relatively inexpensive and can be done in a very short time frame. 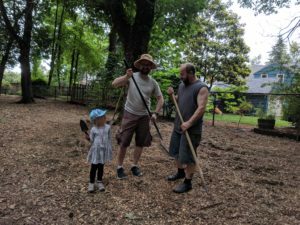 This project will create a pocket of native habitat under some mature Douglas Firs in the park, with a path, seating, boulders, and plenty of habitat for birds. The project is entirely grassroots, from the funding to the planting, but is being conducted under the supervision of the Parks Department. Barbara Linsson has sent out grant applications, seeking up to $10,000 from the Community Watershed Stewardship Program and up to $2,000 from the East Multnomah Soil and Water Conservation District​. We will learn sometime in June if our project has been selected for a grant, and in the meantime will focus on crowdfunding through a platform called Chuffed. The project will proceed in a number of phases, starting with marking out the site, removing turf, adding large boulders, building the fence, adding the gravel path, and then mulching and planting the beds. Each of these projects will require volunteers from the community, which gives people a chance to participate even if they cannot afford to donate cash. However, the most important efforts at present will be in fundraising, as money is what will buy the needed plants and materials to create this space. The Portland Parks department completed a survey of the trees in Wilshire Park in 2017 and has created a website that allows you to see each tree. There are 23 species of trees in the park, with a mix of native and introduced trees. The park is most noted for its mature Douglas Firs, which are Oregon’s state tree. As projects by Friends of Wilshire Park begin, this website will be a useful resource to brainstorm, plan, and reflect on why we all enjoy this park so much.